Please see below for answers to some of the most frequently asked questions we receive at Nectar CBD. Should you have any questions outside of the below, please contact customer service. How is your Nectar CBD manufactured? Nectar CBD manages the hemp cultivation, testing, product manufacturing and distribution of our product line. Where is your hemp cultivated? Nectar CBD hemp is cultivated in Pueblo, Colorado. What strains do you cultivate? Nectar CBD cultivates a proprietary CBD-rich compliant hemp variety. Nectar CBD hemp is organically and sustainably cultivated with an emphasis on regenerative cultivation practices. How do you extract your hemp material? Nectar CBD products are formulated with full-spectrum CBD-rich distillate. After the supercritical CO2 extraction process, the hemp extract undergoes varied purifying processes to create a refined distillate product. As per our product instructions, we recommend refrigerating all Nectar CBD products upon receipt. Are your products made with isolate? All Nectar CBD products are made with full-spectrum hemp distillate extract. What carrier oils do your products use? Our human tincture products are formulated with an organic MCT coconut oil and an organic agave nectar, our pet drops are formulated with an organic MCT coconut oil and our topical product utilizes an organic arnica flower-infused organic olive oil. To review our products, see here. If our products are stored as indicated, the shelf life of our product is six months, though we are constantly evaluating the shelf life and stability of our products. Does Nectar CBD test their products? All Nectar CBD products are tracked and tested during the cultivation, extraction and formulation phases by an independent third-party testing facility. We occasionally send out e-mail newsletters regarding new products, promotions, and updates on hemp, science and nature. Scroll to the bottom of any page on our site and enter your preferred email address to sign-up for our newsletter. 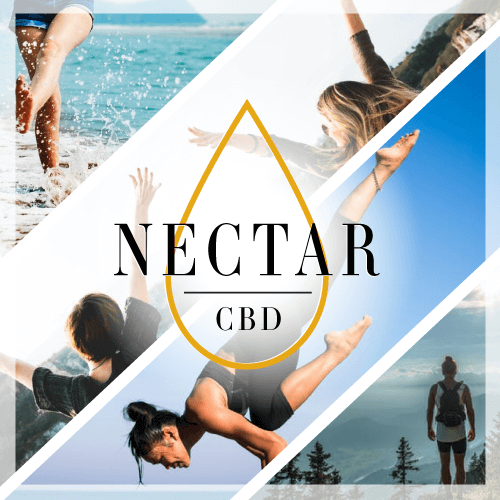 What are the benefits of creating a Nectar CBD account? Once you’ve registered, you will have the ability to view and modify your contact information, view current and previous orders and receive access to member-only specials. The hemp plant boasts an extensive list of diverse applications that are currently being utilized worldwide: automobiles, bioplastics, construction materials, biofuels, paper, nutritional products, body care products, fiber, insulation, animal food and bedding, etc. Hemp, as defined in the 2014 Federal Farm Bill, is “the plant Cannabis sativa L. and any part of such plant, whether growing or not, with a delta-9 tetrahydrocannabinol (THC) concentration of not more than 0.3 percent on a dry weight basis.” This low level of THC ensures the hemp plant remains psychoactive. CBD, or cannabidiol, is one of 100+ cannabinoids, or chemical compounds, found in cannabis. The hemp plants we cultivate, for the Nectar CBD product line, are CBD-rich, meaning they are highly genetically expressive in that one cannabinoid. Hemp-derived CBD oils have gained much attention in recent years amongst the public. Independent research is being continually conducted and to date, has demonstrated that CBD therapy can show improvements for individuals with, including, but not limited to, alcoholism, anxiety, arthritis, cancer, chronic pain, depression, diabetes, epilepsy, inflammation, multiple sclerosis, neurological disorders, PTSD, psychosis and schizophrenia. Distillate is the purest form of hemp extract available due to further molecular refinements processes. Our Nectar CBD distillate is odorless, flavorless, activated (ready for ingestion), potent and ultra-refined. Cannabinoids are chemical compounds found in cannabis. There are 100+ cannabinoids in cannabis plants. The most common cannabinoids include CBD, THC, CBN, CBG, etc. Studies on each cannabinoid, individually, are ongoing, with THC and CBD being the most commonly studied. A full-spectrum plant extract is composed of all plant components, e.g. various cannabinoids, terpenes and other plant compounds. Have you heard of CBD helping with ____ condition? A thorough, condition-specific collection of scientific and clinical research studies, many of which are published on PubMed.gov, are compiled on our Medical Research page. We also recommend you review our blog for updates on medical studies and CBD-related news. Can CBD be used for pets? Dogs, cats, or any other mammal, can benefit from CBD, as they also have an endocannabinoid system. Check our blog for articles on CBD for pets. While we recommend a discussion with your physician, it’s typical to begin with 5-10mg of CBD and to incrementally adjust upwards, if necessary. Do I compare CBD products by MG or %? During the cultivation, harvest and extraction phases, the CBD content of the hemp material is commonly discussed in % value. Post-formulation, however, in product-form, CBD-rich hemp products are commonly compared in milligrams, mg, to describe CBD concentration. According to Colorado State and Federal definitions, the key differentiating factor between hemp and marijuana is the THC-content. Any plant, of the genus cannabis sativa, with less than .3% THC on a dry-weight basis, is considered hemp. Any plant, of the genus cannabis sativa, with more than .3% THC on a dry-weight basis, is considered marijuana. What cannabis plant are your products derived from? All Nectar CBD products are derived from the hemp plant. How much THC do your products have? All Nectar CBD products are hemp-based, and do not exceed .3% THC, as required by State and Federal guidelines. No, all Nectar CBD products are hemp-based, and cannot exceed .3% THC, though they rich in CBD, another cannabinoid which is nonpsychoactive. Though our Nectar CBD products are hemp-based, they do contain trace amounts of THC (less than .3% THC), as they are full-spectrum, which may result in the failure of a drug test. All Nectar CBD products are hemp-based, CBD-rich, do not exceed .3% THC and are nonpyschoactive. We recommend you speak with a physician in regards to the concern. Unless you have an allergy to one of the ingredients listed on our products, we recommend you speak with a physician in regards to concerns on side effects. Do I need a medical card to purchase your product? No. Our products are classified as hemp and are thus legally available to anyone who wishes to purchase them. We ship our Nectar CBD products to all 50 states. Our products are hemp-based and compliant, containing less than 0.3% THC. What is the order shipping policy? We may ship your package using USPS, FedEx, UPS and/or DHL. Customers can expect to receive their order within three (3) to seven (7) business days. If you’ve placed an order and would like to change the items on the order, please contact customer service ASAP. If the order has not shipped, we may be able to modify the order to your liking. If your package has not yet arrived, please check the tracking information provided and inquire directly with the carrier on the delay. All of our shipments are carefully hand-inspected and hand-packed for shipment. If the unopened product you received was damaged during shipment, please contact customer service to process a product exchange within (5) days of shipment receipt. Customers are responsible for checking their shipment for damage at the time of delivery. Once verifying your product exchange request, a paid return label will be e-mailed, to ship the damaged product back, if applicable, and a replacement of your product will be issued at no cost.